In Devon, Matt Baker looks at the work of James Ravilious, who spent years photographing the Devon countryside, and meets one of the farmers who appeared in the photos. Matt Baker and Margherita Taylor are in a very snowy Devon. Matt looks at the work of photographer James Ravilious, who spent years photographing the Devon countryside. He meets Brian Low, one of the farmers who appeared in the photos back in the 1970s and discovers what Ravilious's legacy means to him. Later, Matt returns to Brian's farm to meet some just-born calves, before heading to the farm of Lisa Lucas Ridge, where lambing is in full swing. Margherita meets the people from the Axewood Co-operative, a group who chop down wood and give it away. Margherita meets some of the beneficiaries of this log bank and finds out how this initiative is helping ease fuel poverty locally. Margherita also heads to Greenway, the fabled summer home of Agatha Christie and inspiration for many scenes in her books. The gardens are famous for their camellias, which are in full bloom despite the icy weather. Also in this programme, Hannah Cockroft does a spot of bird-watching, Tom Heap investigates the growth of illegal bloodsports online and Adam Henson sees how virtual reality is being used to train the farmers of the future. Matt heads to the heart of Devon, Chulmleigh, to discover the incredible body of work of photographer James Ravilious. James spent a quarter of a century, from the early 1970s to the 1990s, documenting all aspects of rural life in the small patch of countryside between the rivers Taw and Torridge. Matt meets his widow, Robin Ravilious, who tells us of his modest character and ability to put his subjects at ease so they behaved naturally. She also shows him James' compact camera, which he used masterfully to create his stunning photographs of Devon and its people. Margherita finds out about a scheme helping those struggling to stay warm in winter. The Axewood co-operative in Honiton was set up ten years ago, with a simple premise: volunteers would carry out land management for free and, in return, landowners would let them keep any wood they chopped down. But, after realizing they were producing more wood than they could use, they decided to work with local charities to find and distribute their excess logs to those in need. Margherita meets Wendy Robertson, for whom - like many in the area - the guarantee of logs for her wood burner, has proven life-changing. Matt finds out the realities of farming in freezing conditions - and there must be something in the frosty air because, on two neighbouring farms, they're welcoming new life into the world. Keeping the newly-born calves and lambs warm in this weather is a priority. Matt lends sheep farmer Lisa Lucas Ridge a hand with a tricky lambing in the triplet barn. It's touch and go - but that's something Lisa's dealing with night and day over lambing season. Tom investigates how illegal animal bloodsports are finding a new audience online.Social media is being used to share footage and pictures of organised animal cruelty - including cockfighting and hare coursing.The police say gangs are even livestreaming footage both here and abroad to enable wider gambling.So are the big social media providers doing enough to crack down on these sickest of sports? 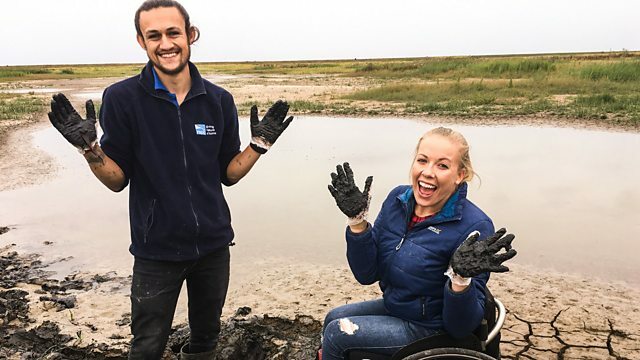 Paralympian athlete Hannah Cockroft heads to RSPB Frampton Marsh in Lincolnshire to meet Anthony Bentley who is the youngest assistant warden to ever work on the reserve. Hannah spends a day finding out about Anthony’s job. First up, they check the sticky mud for the presence of blood worms as they are a valuable food source for many of the wading birds on the reserve. Next, it's the back-breaking task of raking reeds on the breeding islands which can only be accessed by a rowing boat. But, after a hard day’s graft, Hannah and Anthony get to sit back and do a spot of birdwatching...which makes all that hard work worthwhile. She's the best-selling queen of crime-writing, but there's one place Agatha Christie loved even more than a grisly and gruesome ending. Margherita heads to Greenway - the stunning estate above the River Dart that once belonged to the novelist. It was there that she would sit and dream up the latest murderous machinations to be uncovered by Poirot and Miss Marple. Margherita hears first-hand what it was like growing up at Greenway from Agatha's great-grandson and explores the author's much-loved 190-year-old camellia garden.